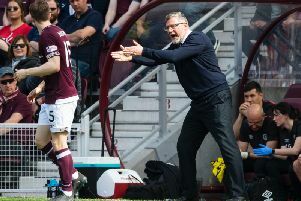 HEARTS manager Robbie Neilson has hit out at referee Willie Collum, claiming the official cost his men their place at the top of the Premiership table. He also said that a red card had been almost inevitable once he learned who would be refereeing and revealed he had tried to limit any damage by training with ten men in the build up. The decision to send Callum Paterson off swung the game in Hamilton’s favour and allowed Martin Canning’s men to battle back from 2-1 down to win the game 3-2 with two late goals. “We looked at the stats during the week. We get a referee and we look at what the stats are and what way they referee the game. All of them referee differently. But with this game, with the officials we were getting, we knew there was a high probability of a man being sent off and it’s happened again. Having received no satisfaction from a post-match meeting with Collum, Neilson intended to call the Scottish Football Association’s referee supremo John Fleming to air his grievances.